Once your cruise has returned to New Orleans, take a journey back in time to the Antebellum South with a tour of two separate plantations -- Oak Alley Plantation and Laura Plantation.Your first stop is at Oak Alley, which has been called the "Grande Dame of the Great River Road". Next, travel to Laura Plantation, a historic sugar plantation built in 1805 displaying a different and unique Creole culture. After your arrive in New Orleans, you will first travel to Oak Alley Plantation, passing and hearing about the Whitney, St. Joseph and Evergreen plantations along the way. 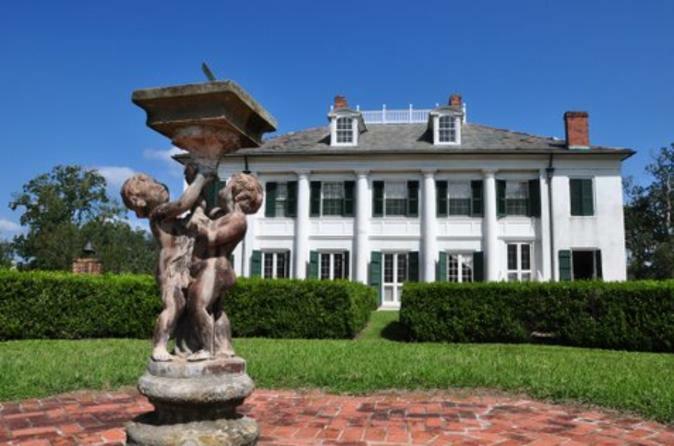 Your guided tour of Oak Alley Plantation allows you time to admire this jewel of Greek Revival architecture. The quarter-mile canopy of giant live oak trees, believed to be nearly 300 years old, forms an impressive avenue leading to the classic Greek-revival style antebellum home. Next visit the Laura Plantation, a Creole Plantation with historic slave quarters surrounded by sugar cane fields. The guided tour transports you with dramatic detail into the charmed yet tragic lives of four generations of Creole owners and their slaves. You can catch the tour at two different departure times, 8:30am or 11:30am. Your guide will pick you up at your downtown New Orleans hotel. If you are arriving on a cruise ship, a meeting location will be determined based on your additional plans. It is very important to call local supplier at least 48 hours before the day of the tour to verify pickup place and time. Phone number is provided on confirmation voucher.